Organization: Cones, 10 yards apart, 20 yards from player to player lines. Two balls, one for line A and one for line D.
Activity:C runs to center to recieve pass from A, C then dribbles around center defender and then passes back to line C. Then switch, D runs to center where player recieves pass from B, D dribbles around center defender, then sends ball back to line D. Next, A runs to center to recieve pass from line C, etc. Keep repeating, should move quickly. 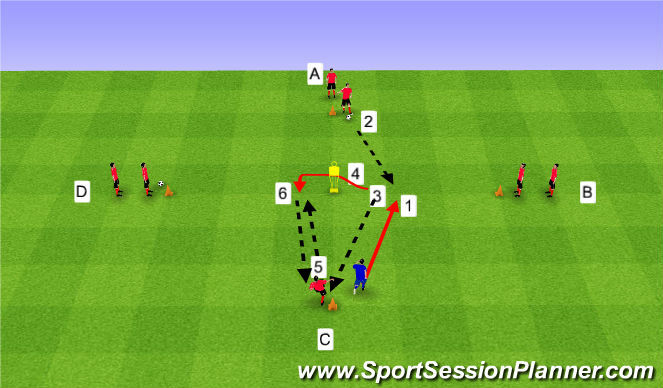 Variations:Progression One: Recieve pass and quickly move around the defender. Coaching Points: Speed, accelerate to recieve ball quickly, on toes ready to recieve. Keep ball close to body. First touch is critical to move around the defender safely. Organization:Cones, 10 yards apart, 20 yards from player to player lines. 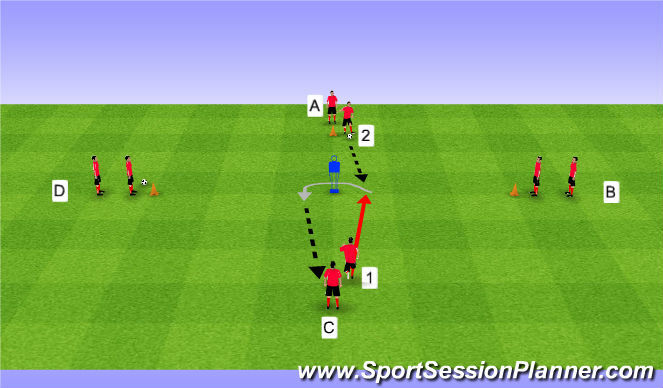 Two balls, one for line A and one for line D.
Activity:First player in Line C runs to center (1) to recieve ball from line A (2), he turns back to Line C and passes to player at C cone (3), then makes a run around center defender (4), Line C player passes back to left of defender (5), player in center quickly passes back to line C(6). That player then returns to back of line C where he came from. Same thing with D to B, then repeat. Should move quickly. Variations:Progession 2: Give and go pass. Coaching Points:Speed to recieve pass, on toes, ready to recieve. Make good, strong passes that your teamate can control. When turning with ball, turn body away from center defender, then turn quickly, accelerate around defender to recieve ball quickly. Players all need to be on their toes ready for this to work smoothly and quickly.